Solution 1(CP1):1-5Meters 2.45GHz Long Range Vehicle Access Control . Solution 2(CP2):1-10Meters 2.45GHz Long Range Parking Control System. Solution 3(CP3):0.7-1.2Meters EM card Mid Range Parking Access System. 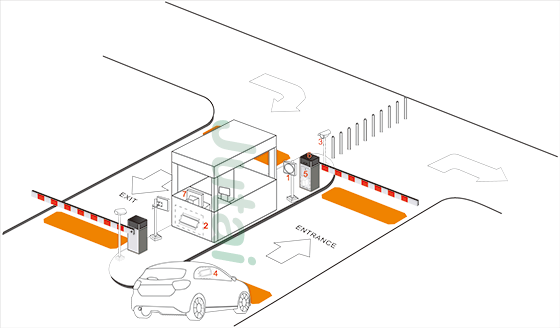 JT offer total solution for long range parking access system – long range reader, access controller and software with CCTV picture capture integration. JT solution is optimized to achieve more convenient usage, faster pass through rate and higher security level at more affordable cost. You can start to enjoy the benefit of JT automation technology. 1.The tags not need adjust the angle. 2.Our 2.45GHz reader housing is casting aluminium.the infared housing is steel or ABS. 3.Work with our LD-100 high speed vehicle detector.then can be faster pass. Long range reader reads the transponder inside of vehicle from far and barrier gate is triggered to open ahead of time. Barrier gate is already fully opened by the time vehicle arrived at entrance. Vehicles can continuously enter without the need to fully stopped for flashing card at reader. This allow higher traffic flow and reduces traffic jam especially during peak hours. The card can't be copy. JTAC-20T guard house verify card number, expiry date and access permission. Upon approved identity, AC-20T will open barrier gate and trigger DVR to capture picture. JTIV-200 IP Video Camera,can connect to software direction,not need to add another DVR Video Server.Save money.and control easy. Can't be copy,easy to use,hands free system. Also can used for remote control.Light Control. JTBG-630 1.2s,3s,6s be selected; Arm 3-6m; The clutch on pendulum axis, barrier boom upped quickly by hand underPower status, rest automatically when power off. JT AC-26000 software display live picture captured and record event log of each entry and exit. Compared to All of the world system, JT mid range lift access system can allow everyone to truly enjoy the benefit and convenient of long range reader at a very low price. JT is Factory,Can give you good supply.